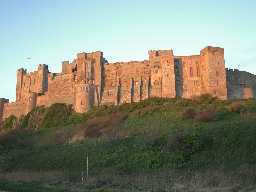 Bamburgh Castle. Photo by Andy Brown, 2003. Bamburgh Castle is a spectacular medieval castle built in a long narrow outcrop of rock on the coast. The earliest occupation probably dated to the Anglo-Saxon period. The carved arm of a stone chair has been found. Its decorations belong to the late 8th or early 9th century. Geophysical survey has shown a number of features, which may be Anglo-Saxon buildings in the Inner Ward. However, no other remains of this period can be seen. Most of the buildings at this site belong to the medieval period. The central part of the castle is the 12th century keep. There are three enclosures, or baileys, next to the keep. These are entered through fortified gatehouses. The remains of a 12th century chapel can also be seen. It had fallen into ruins by the early 18th century, when it was bought by Lord Crewe. When he died, he left it to a charity. The trustee of the charity, Dr Sharpe, set about making it habitable, and the buildings were used for schools, a hospital, a granary and a lighthouse. The entire site was completely restored in 1890. The castle is a Grade I Listed Building protected by law.